In an age when radio talk shows, all-news cable networks and seemingly infinite arrays of internet websites offer round-the-clock reports of thievery, adultery and brazen stupidity on the part of politicians, it may be well-nigh impossible to believe there ever was a time when Americans were less cynical, and more respectful, in their views of elected officials. Indeed, as far back as 1939, when filmmaker Frank Capra unveiled Mr. Smith Goes to Washington, American voters already were accustomed to logrolling and pork-barreling as instinctive behavior of political animals. But the transition from healthy skepticism to deep-rooted distrust -- or profound disgust -- on the part of the electorate is a relatively recent phenomenon. Capra’s classic comedy about virtue triumphant (though just barely) over Washington corruption is throwback to the days when most people still wanted to believe that public servants really served the republic. Jefferson Smith, the soft-spoken but steel-spined hero stirringly played by James Stewart, is a small-town do-gooder. He heads the local branch of a Boy Scouts-type organization, quotes Thomas Jefferson and Abraham Lincoln at exhaustive length and, evidently, thinks his best gal pal is his dear old mom. In short, Jeff is such a starry-eyed naïf that he seems a perfect choice to serve as “honorary stooge” when one of his state’s U.S. Senators dies. Political boss Jim Taylor (Edward Arnold), a robustly venal string-puller, voices a few doubts about appointing this “big-eyed patriot” to serve the remaining two months of the late legislator’s term. But the state’s other senator, Joseph Paine (Claude Rains), a silver-haired paragon of faux virtue, insists that he’ll be able to keep the “simpleton” in line. Yeah, right. Initially, Jeff appears every bit as green and gawky as his handlers hoped. As soon as he reaches Washington, D.C., he slips away on his own, to take a bus tour of the nation’s capital. (Cynics often point to this sequence – a shamelessly sentimental and spirit-pumping montage of the Washington Monument, the Lincoln Memorial and similarly impressive icons – as representing the worst excesses of what detractors label as “Capra-corn.” In his defense, Capra claimed that when he first took the Washington tour, he felt the same rush of excitement – “I got a bad case of goose pimples!” – that inflames Jeff Smith.) Later, while Jeff is being tutored by his cynical secretary, Clarissa Saunders (Jean Arthur), the dewy-eyed newcomer decides he should pay a visit to Mount Vernon, for inspiration, before his first day of duties in the Senate. It doesn’t take long, however, before Jeff gets wise to the ways of Washington. Our hero is horrified to discover that Senator Paine – a long-time family friend who knew Jeff’s late father, a crusading newspaper editor – is part of a plot to procure federal funding for a dam on property purchased by Taylor and other scalawags. Worse, when he tries to expose the dirty dealing, Jeff is framed as a corrupt hypocrite by Senator Paine himself. But don’t worry: Jeff may have a few dark moments of doubt, but he ultimately rises to the occasion. 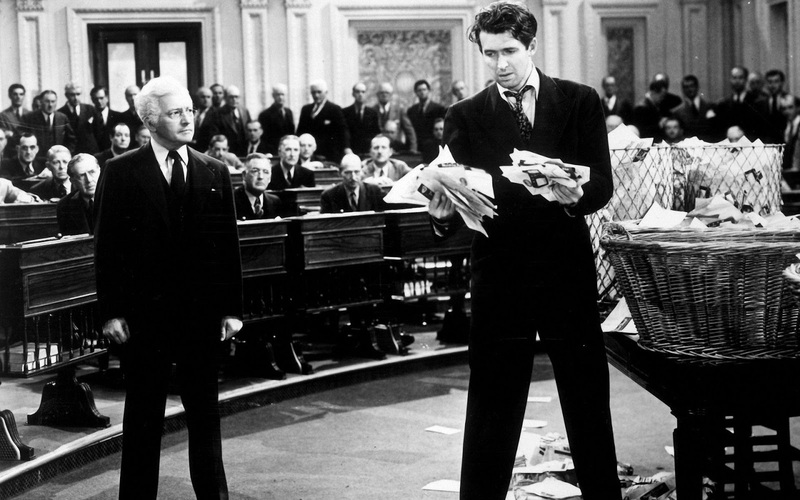 In the movie’s most famous sequence, he defends himself – along with truth, justice and the American way – in a passionate filibuster that he sustains at great cost to his health and reputation. Gravely conscience-stricken, Senator Paine eventually admits his chicanery on the Senator floor, instantly vindicating Jeff. Viewed today by jaded audiences, Mr. Smith Goes to Washington might seem quaintly timid in its treatment of money-grubbing politicos, hard-drinking reporters and well-heeled power brokers. In 1939, however, many members of the political establishment loudly decried the movie as scurrilous libel. Washington reporters were enraged by Capra’s depiction of the Washington press corps as boozy and irresponsible. (Thomas Mitchell plays the booziest of the lot, and very nearly steals the picture.) The hostile response to a preview screening in Washington, D.C. remains the stuff of Hollywood legend. Joseph P. Kennedy, then U.S. ambassador to London, reportedly went so far as pressing Columbia not to release Mr. Smith in Europe, lest American prestige be undermined just as Adolf Hitler was making such a nuisance of himself. The delicious irony is, Capra didn’t realize what a subversive piece of work he had concocted until long after the cameras stopped rolling. As he explained in his 1971 autobiography, The Name Above the Title, Capra intended Mr. Smith as a valentine to American democracy, a heartfelt tribute to a form of government that guaranteed a single, right-thinking individual had the opportunity to stand up and be counted. Propelled by the kind of foursquare, flag-waving patriotism that perhaps only an appreciative immigrant wouldn’t deem extreme, Capra – a Sicilian native who reached U.S. shores at the age of six – wanted his small-town hero to represent all that was noble, honest and idealistic about America and Americans. Decades later, many Americans continue to view Jefferson Smith as the kind of elected official they’d like to have. In fact, politicians as diverse as Bill Clinton and the late Sonny Bono have cited Mr. Smith as a major influence on their decision to run for office. Trouble is, most Americans also recognize Senator Paine as the kind of elected official they usually have to settle for. thanks, nice post. loved it.